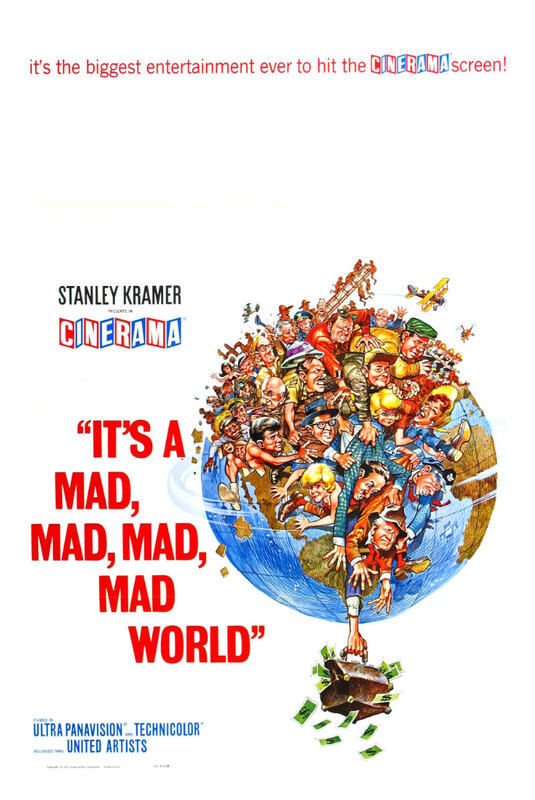 In 1963, the world was blessed with Stanley Kramer’s over the top madcap chase comedy aptly titled It’s a Mad, Mad, Mad, Mad World. Before this, however, Kramer was known as a dramatic directors with acclaimed films like Inherit the Wind and Judgment at Nuremberg as testament. What a way to enter the realm of comedy than with a movie that stars more comedians than any movie before it, and I’d wager since. This is a huge, epic comedy with action, excellent stunt work, riotous cameos, and slapstick comedy that brought the genre to a whole new level. To put it simply, this is one of the funniest movies ever made. 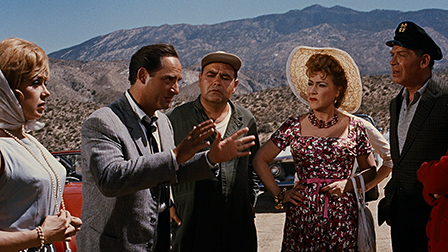 After careening his car off of a California highway, “Smiler” Grogan (Jimmy Durante) tells a group of witnesses about a briefcase with $350,000 buried under a giant “W” in Santa Rosita State Park. Thus begins a race by this group (including Milton Berle, Sid Caesar, Ethel Merman, Mickey Rooney, and Jonathan Winter) to get to Santa Rosita and uncover the fortune for themselves. Along the way, alliances are made and broken, vehicles are destroyed, and one gas station is completely obliterated. While all this is happening, police captain T.G. Culpepper (Spencer Tracy) is keeping a watchful eye and planning his own way to get a hold of the hidden money and start a new life for himself. If ever there was a need to talk about the cast of a movie, this is the time. One of the taglines appropriately reads, “Everybody who’s ever been funny is in it!” While that may not be completely accurate, it certainly doesn’t seem to stretch the truth too far. Besides the names I’ve already mentioned, the case also includes Buddy Hackett, Eddie Anderson, Peter Falk, Phil Silvers, Jack Benny, The Three Stooges, Jerry Lewis, and even Buster Keaton. The crazy part is that that still isn’t everyone. This movie is completely PACKED with Hollywood’s funniest people at the time. Even if you couldn’t care less about the plot involving hidden money and the race to get to it, this movie is worth seeing just to see all of these people in the same film. It’s a blast trying to spot everyone. While this is a really funny movie, a lot of the humor stems from the action set pieces that happen. Believe it or not, this is a very action heavy movie with car chases, plane stunts, and people just getting flung all over the place. The stunt work is absolutely fantastic and the chases are fast and exciting. It was cool to watch a movie that was as exciting as it was hilarious. From beginning to end, It’s a Mad, Mad, Mad, Mad World does not slow down and refuses to come to a halt of any kind. That’s pretty impressive considering it’s nearly 3 hours long. The full length cut available from Criterion is actually three and a half hours long, so I’d be curious to see how it holds up with those extra 45 minutes. There’s so many great characters and actors in this movie that it’s hard to choose favorites, but it’s worth a shot. Jonathan Winters and his character Lennie Pike are high on the list for a very important reason. There’s a scene where Pike single handedly destroys an entire gas station. There is nothing left standing by the end of the rampage, and that’s honestly my favorite part of the movie. I also really loved Terry-Thomas as the British J. Algernon Hawthorne, a slimy kind of guy who has nothing nice to say about America or the people in it. Finally, whenever Sid Caesar was onscreen, it was hard not to laugh. He plays a sort of straight man dentist named Melville Crump, and seeing someone that straight laced in the middle a situation as off the wall as this is just hilarious. Anyone who likes to laugh either already has seen or must see It’s a Mad, Mad, Mad, Mad World. It’s an exciting chase movie, a magnum opus of slapstick, and the ultimate conglomeration of funny people to ever grace the silver screen. After the success of this movie, Stanley Kramer went on to direct more comedies, and why wouldn’t he after showing just how good at it he actually was. It’s a Mad, Mad, Mad, Mad World should be on any film lover’s list for funniest movies ever made, and if it isn’t I’d have to hear why.